Do you know that many times when you are craving chocolate its because you are deficient in magnesium? Chocolate is chock full of magnesium and its why many women crave it during the month. 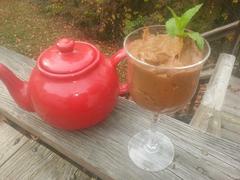 A yummy way to get your chocolate fix in a healthy manor is to make this chocolate pudding. Healthy? You're kidding. Nope, I so enjoyed this today and I hope you will also. 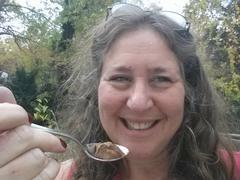 How do you make chocolate pudding creamy and delicious without adding white sugar? As I played in the kitchen I was aiming for a sweet treat with protein, fat and minimal sugar. This was delicious. I began mixing it in the Vitamix and as I tasted it on the first try I found that it was so difficult to get out of the blades soI poured it into my food processor as it still needed more ingredients. It turned out fabulous. It will taste delicious once you refrigerate it. Top with whipped cream, crystallized ginger, goji berries, raspberries, just use your imagination, or do what I did and just eat it straight.